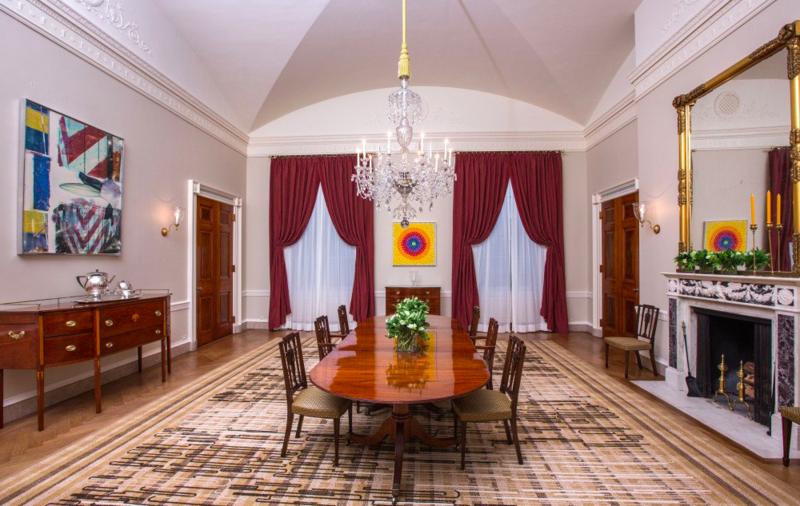 Paintings by Alma Thomas and Robert Rauschenberg in the White House family dining room. Photo: Amanda Lucidon, courtesy the White House. In September 2017, the White House requested an art loan from the Guggenheim Museum. 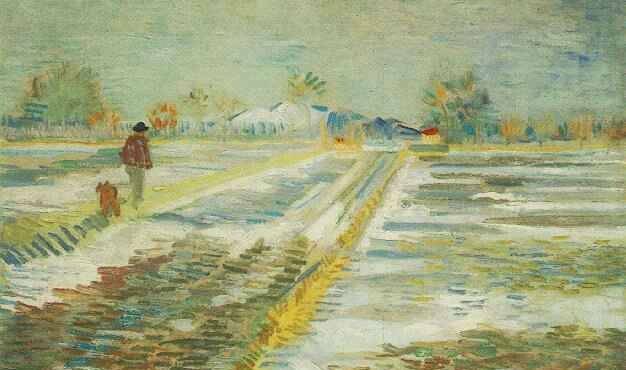 The painting in question is Vincent Van Gogh's Landscape With Snow, an 1888 oil painting of a man wearing a black hat walking his dog across the snowy landscape of Arles, France. According to Art News, Chief Curator of the Solomon R. Guggenheim Foundation, Nancy Spector, told the White House that the museum was unable to comply with the request, explaining that the painting is “prohibited from travel except for the rarest of occasions,” and that it was on its way to the Guggenheim in Bilbao. Spector, who has been outspoken about Trump’s administration on social media, suggested Maurizio Cattelan's America instead as a more apposite long-term loan. 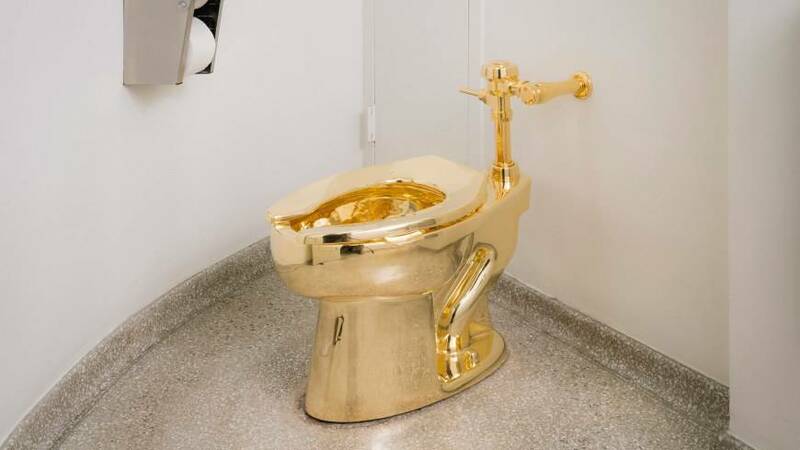 America is a fully functional, eighteen-karat solid-gold toilet that has been installed in a bathroom on the museum’s fifth floor in 2016. With a guard outside the restroom door monitoring the work, visitors have the chance to interact with both the installation, and what it means to be the 1% that can afford such things. “It is, of course, extremely valuable and somewhat fragile, but we would provide all the instructions for its installation and care" Spector wrote in an email. It is commonplace for Presidents to borrow masterworks from major museums as well as purchase new works for the White House permanent collection. Choosing artworks for the embellishment of the white house holds great significance and responsibility and should not only showcase American tradition, but stay relevant, open new dialogues and represent the nation's multicultural background. Former First Lady Jacqueline Kennedy once said, "Everything in the White House must have a reason for being there." The Obamas, for instance, borrowed numerous works from prestigious museums. Unlike their forbearers, they diversified and modernized the White House collection to include works of 20th and 21st Century art as well as works by female artists of African-American, Asian and Hispanic descent. Maurizio Cattelan is an Italian conceptual artist known for his subversive and humorous displays; his work often satirizes popular culture, authority figures and the art world itself. 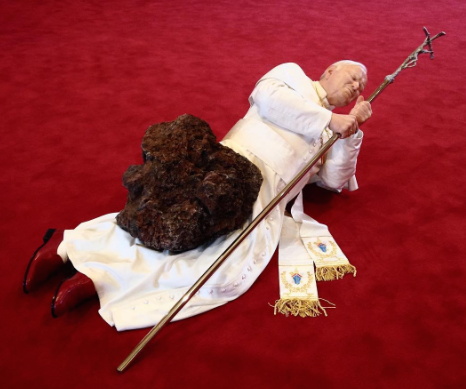 Among Cattelan’s most startling sculptures is, La Nona Ora (The Ninth Hour) a life-sized effigy of Pope John Paul II struck down by a meteor. The work is a scathing comment on our current reality, from the excesses of the art market, to the mounting gap between the poor and the wealthy. And, emblematic of this massive discrepancy, the United States elected a billionaire to its highest office. It is hard to fathom how someone who has called for the elimination of the National Endowment for the Arts and the National Endowment for the Humanities, something that would paralyze the nation’s cultural life, would want to surround himself with art. However, the president is known for decorating his residences with gold, thus he might accept Spector’s suggestion and find it a great place to contemplate his morning tweets.